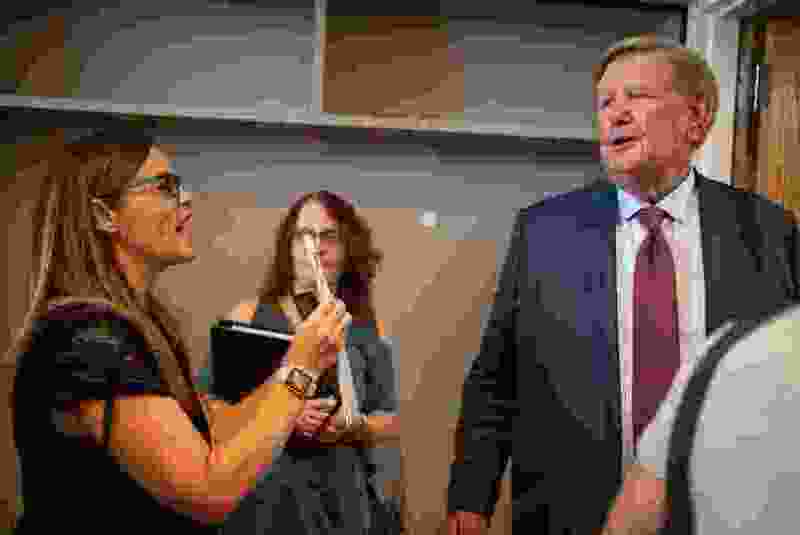 (Trent Nelson | Tribune file photo) Candi Huff confronts Kem Gardner after a news conference where a coalition including the LDS Church came out against Utah's medical marijuana initiative, in Salt Lake City, Aug. 23, 2018. The words “truth” and “fact” have been used liberally by the combatants for and against a ballot initiative that would establish a full-fledged medical cannabis program in Utah. One side suggests the initiative, Proposition 2, would turn Utah into a virtual Wild West of cannabis use. Recreational users could walk the streets, their pockets stuffed with marijuana, with near impunity. Dispensaries would sell toothsome, cannabis-laced candies and brownies appealing to youngsters. Patients would be allowed to stockpile marijuana in their homes without any legal repercussions. The groups supportive of the ballot initiative envision the post-Prop 2 world much differently. Cannabis distribution would be controlled, so the substance would end up only in the hands of patients at the recommendation of a doctor. So what’s a voter to believe? To help, we sifted through a few of the claims and checked them for factual accuracy and honest presentation of information. All the below statements are from the websites for Drug Safe Utah, one of the groups dedicated to defeating Proposition 2, and the Utah Patients Coalition, which sponsored the ballot initiative. Free-for-all? That’s probably a bit alarmist, says Paul Cassell, a criminal law professor at the University of Utah. The ballot initiative would create an “affirmative defense” for certain people caught with marijuana before the state’s medical cannabis program is fully functional. The provision wouldn’t strip away an officer’s authority to arrest someone who is carrying the substance, Cassell explains, but could enable that person to fend off a criminal conviction. To exercise the defense, a person would have to show in court that he or she would've qualified for a medical cannabis card if the state were issuing them. Basically, it provides legal coverage for cannabis patients while Utah officials are revving up the medical marijuana program. It is true that the provision could complicate marijuana prosecutions, Cassell says, especially if the courts give a broad interpretation to the affirmative defense language. And it would be challenging for police officers in real time to separate patients from potheads. Still, as Cassell, a former federal judge, reads Prop 2, the affirmative defense wouldn’t shield everyone — only ill people in possession of small amounts of marijuana. Gayle Ruzicka of Drug Safe Utah says she’s spoken with a number of police officers who told her they’d stop arresting people for pot possession if Prop 2 passes. “Because they know what would happen if they go to court. They go through all the problems with arresting and booking. ... Then, it’s up to the judge. And under the affirmative defense provision, the judge will let them go,” she says, adding that she stands behind her organization’s warning about a recreational free-for-all. A spokesman for the Utah Sheriffs' Association says that the provision would complicate but not preclude enforcement of possession laws. “It would be more difficult to enforce, but to say that law enforcement is just not going to enforce marijuana laws, I don’t think we’d say that,” Reed Richards, the Utah Sheriffs' Association spokesman, says. Traffic fatalities have increased in Colorado over that time period, but there’s debate about how much marijuana use is to blame. The numbers cited by Drug Safe Utah come from a law enforcement coalition formed through the Rocky Mountain High Intensity Drug Trafficking Area program. This group’s tally classifies a fatality as marijuana-related if any trace of the substance shows up in driver drug tests, according to Sam Cole of the Colorado Department of Transportation. The problem, says Cole, is that marijuana can stay in a person’s system for weeks, long after its effects have worn off. Cole says his department crunches its numbers based on the state’s definition of driving under the influence — getting behind the wheel with five nanograms or more of active THC in the system. By the department’s count, marijuana was a factor in 35 traffic fatalities in 2017; by comparison, the police task force linked cannabis intoxication to 138 traffic deaths that year. But here’s the other thing: Colorado is a recreational state, so it might not be the best predictor of what’ll happen if Utah adopts a medical program. Especially because medical marijuana programs are actually associated with a drop in traffic fatalities, some researchers have observed. One Columbia University study found states that passed medicinal cannabis laws experienced an average 11 percent decline in traffic deaths (although some states saw increases). The reason for this is unclear — it might be because people are turning to cannabis instead of alcohol, says Benjamin Hansen, a professor at the University of Oregon. Hansen says his research on medical marijuana laws has yielded similar results as the Columbia study. “On net, we find traffic fatalities fall, and that this ... is largely driven by decreases in drunk driving,” Hansen writes in an email. Ruzicka defends her group’s use of Colorado as an example, saying that state has a lot in common with Utah. The neighboring states have rugged landscapes and similar ways of life, and she notes that both are covered by the Rocky Mountain High High Intensity Drug Trafficking Area program. Teens who use marijuana do tend to lose some IQ points along the way, that much is backed by scientific evidence. But there’s a twist: Cannabis might not be the culprit, some researchers say. At least, that’s what researcher Joshua Isen took away from a multiyear study of hundreds of twins in California and Minnesota. Isen, a professor at the University of South Alabama, did observe an IQ drop among young people who reported using marijuana in their teen years. But when he examined situations in which one identical twin smoked pot and the other didn’t, he found no difference — he saw the same IQ declines for both siblings. This phenomenon suggests that there’s another factor (maybe family environment or genetics) at play, one that’s both affecting the teens' IQ and increasing their likelihood of marijuana use. In other words, as Isen puts it, the marijuana might be the symptom and not the cause. However, Madeline Meier, an Arizona State University professor who has also examined teen cannabis use, says her research has looked into other potential causes. Her 2012 study showed IQ decline from childhood to adulthood among teen cannabis users and took into account alcohol and other drug use, low socioeconomic status and other factors. “None of these factors could explain why adolescent-onset persistent cannabis users showed IQ decline,” she writes in an email. A large, ongoing study funded by the National Institutes of Health is looking at whether cannabis interferes with adolescent brain development, she notes. Yup, that’s what the review concluded. There was also moderate evidence that medical cannabis could treat sleeplessness associated with a variety of conditions and limited evidence showing its effectiveness for dealing with anxiety, increasing appetite in HIV/AIDS patients and treating other ailments. The same paper found there was little or no evidence that cannabis or marijuana products helped with cancer, epilepsy, symptoms associated with amyotrophic lateral sclerosis, symptoms of irritable bowel syndrome and an array of other conditions. Some of these are listed as qualifying conditions in Prop 2 and the legislation that Utah lawmakers are poised to consider, likely next month. But Donald Abrams, who was part of the large review from last year, says it’s important that people understand why there’s a shortage of evidence in many cases. “There is a real lack of funding to be able to study it as a potential therapeutic intervention,” says Abrams, an oncologist and professor of medicine at the University of California, San Francisco. And he notes that since the review came out last year, other papers have come out with more evidence of marijuana's therapeutic benefits. “Some of the things are currently being studied or never will be studied but show benefit in people’s anecdotal experience,” he says. This is an accurate summary of the study’s findings. But the jury is out on whether medical marijuana laws help combat opioid addiction. This and several other studies “can’t show that medical marijuana legalization caused the decrease in deaths or that pain patients changed their drug-taking behavior,” the National Institute on Drug Abuse states on its website. Moreover, there is some evidence suggesting cannabis use actually increases the risk of developing an opioid dependancy. More research is in the works to see whether medical marijuana is an effective tool in the battle against opioid abuse. DJ Schanz, director of the Utah Patients Coalition, stands behind his group’s assertion and says the American Medical Association is the foremost authority on the issue, so what it says should carry a lot of weight. The available evidence shows cannabis does not serve as a gateway to addiction, he argues. “We think it’s not a gateway in but a gateway out from potentially fatal and much more addicting drugs that are out there,” he says.